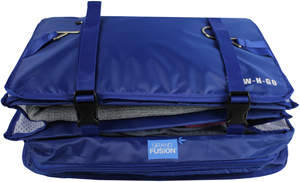 A small team of industry veterans founded Grand Fusion Housewares, Inc. to develop innovative consumer products that make life easier. One of their latest items is the Stow-N-Go Hanging Travel Shelves, a patented luggage organization system. Stow-N-Go Hanging Travel Shelves is a three-tiered hanging organizer that simplifies packing and unpacking while keeping clothing wrinkle free, and taking up to 30% less space. To pack, hang Stow-N-Go from a closet rod and fill its shelves. It accordions into any 20” or larger carry-on suitcase. To unpack, lift it out and hang it, and it’s like a mini dresser with your clothing neatly arranged. For more information, visit grandfusionhousewares.com or contact Brendan Bauer at brendan@grandfusionhousewares.com; 972-334-9891.